Anyone who knows me understands that I'm a fan of simple, minimalistic fashion. Yes, I work in fashion, and yes, I'm not adverse to a sparkly piece or two, but on the whole, my day-to-day fashion sense is white, grey, black and blue. When I got married three years ago, I decided that as I wanted to feel comfortable and most like myself on the day, I needed to go for a dress that suited my personality, which is why I went for a simple wedding dress. I also felt that it reflected the venues we'd chosen. We opted for an urban wedding so the frock I ended up choosing suited the surroundings (a key tip I don't think many brides consider when selecting a wedding dress). While I had looked at a lot of gowns, in the end, I went for the Thea dress from Belle & Bunty, a boutique in London. Not only did the brand fit it perfectly to my body, but it was also friendlier for my budget. If I've convinced you, then, good news, as there are plenty of simple bridal dresses that are so chic that you'll have everyone coming up to years later telling you how much they loved your dress. If this is the route you want to take for your bridal frock, keep scrolling for the best simple wedding dress selection. There's no bling, but folds give this gown detail. This one-shoulder dress is still sassy while remaining modest. A gorgeous slip dress doesn't need anything else. This one is all about the back. Another open-back dress, but the long sleeves make it feel sophisticated. 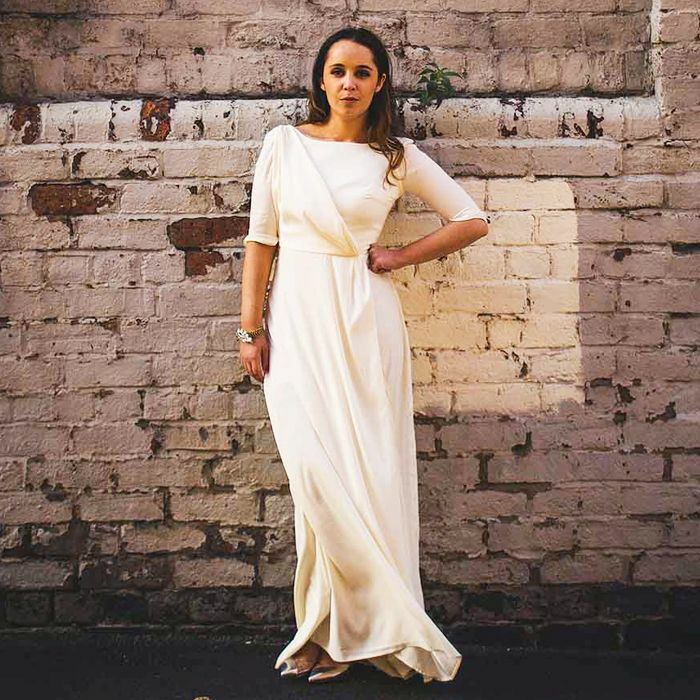 It's easy to see why plenty turn to this Aussie wedding dress brand. For those who want a short shift. For something completely different? Turn to Jil Sander. Belle & Bunty's bridal range has grown substantially since I bought mine, and this is a dress I would get now. Yep, you can get an easy-to-wear bridal gown on the high street. If your style is really laid-back, we've found the piece for you. Another super-affordable dress for the bride on a budget. The name of the dress says everything: Hollywood glamour in a gown. Want more bridal inspo? Check out the best high-street wedding dresses.